HOUSTON (August 1, 2018) – Jiffy Lube and the Muscular Dystrophy Association (MDA) are teaming up for the seventh annual MUSCLE UP!℠ campaign, aimed to help transform the lives of families affected by muscular dystrophy, ALS and related muscle-debilitating diseases. Throughout the month of August, Jiffy Lube customers are invited to make a donation, at participating locations, of $3 or more to MDA, helping to fund programs for families in their community. In return, customers receive a MUSCLE UP! savings books containing offers totaling more than $100 from Jiffy Lube and other national retailers, including Men’s Wearhouse, Fuddruckers® and Office Depot®. One hundred percent of funds raised benefit MDA and its life-enhancing programs such as state-of-the-art clinics and support groups, as well as MDA Summer Camp, a week-long camp that provides opportunities for kids living with neuromuscular diseases to discover new interests, gain self-confidence and experience the independence of being away from home in an environment where barriers do not exist. Since launching MUSCLE UP! in 2012, the campaign has raised more than $5.5 million in support of research and MDA services and has sent more than 2,750 children to MDA Summer Camp. "Support from partners like Jiffy Lube makes it possible to accelerate research to find urgently needed treatments and cures for muscle-debilitating diseases," said MDA Executive Vice President and Chief Philanthropy Officer Karen Lewis Alexander. "In the past year, four new drugs have been approved by the FDA for the treatment of Duchenne muscular dystrophy, spinal muscular atrophy and amyotrophic lateral sclerosis (ALS). 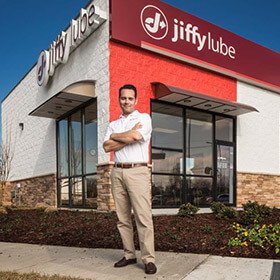 These are milestones that would not have been possible without the generosity of loyal Jiffy Lube franchisees, service center employees and customers. We are so grateful for our partnership." For more information, visit www.mda.org/jiffy-lube .